Product code: ES8001 Categories: Sold Items, Sold Rings. Here is such a beautiful 15ct rose gold and platinum Art Deco diamond cluster ring that dates from the 1920’s and is so unique for so many reasons. Hand made in such an elegant design, the band was made in 15ct rose gold. 15ct gold was used up until 1931 and the colour of the band is so beautiful with that lovely warm tone to it that looks even more beautiful on the skin. And then there are the diamonds set into platinum that really makes them stand out even more and is made even more special by having not one row of diamonds, but two. In the first row are eight single cut diamonds and in the second row a further twenty two single cut diamonds, and including the centre diamond, they come to a total of 0.51 carats. With a diameter of 10.9mm, this ring sits so well on the finger and is destined to always be admired. A very special and unique example of an Art Deco diamond ring. 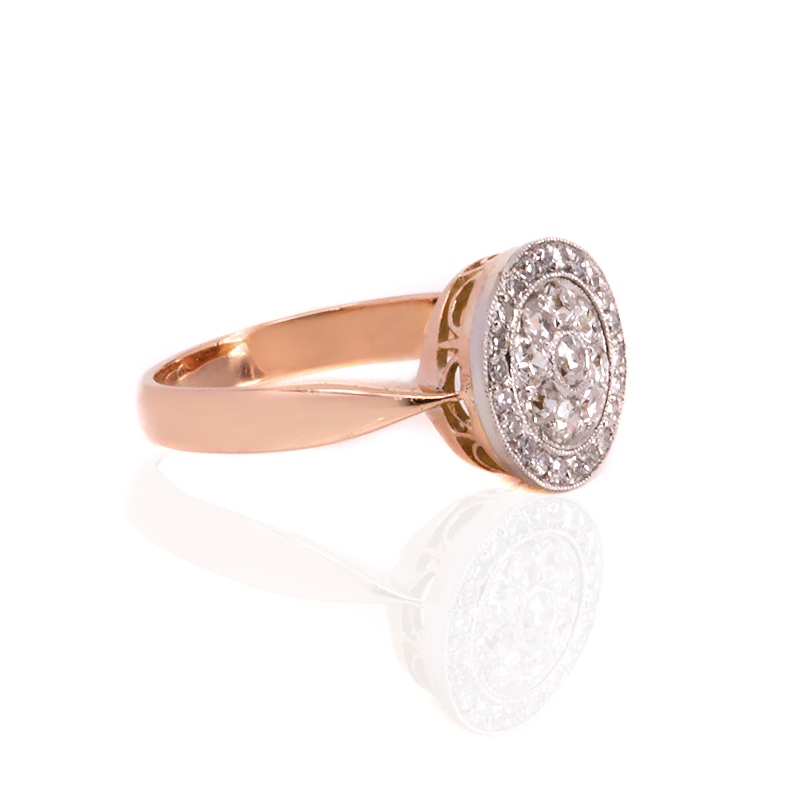 This Art Deco diamond ring was set in rose gold and platinum. 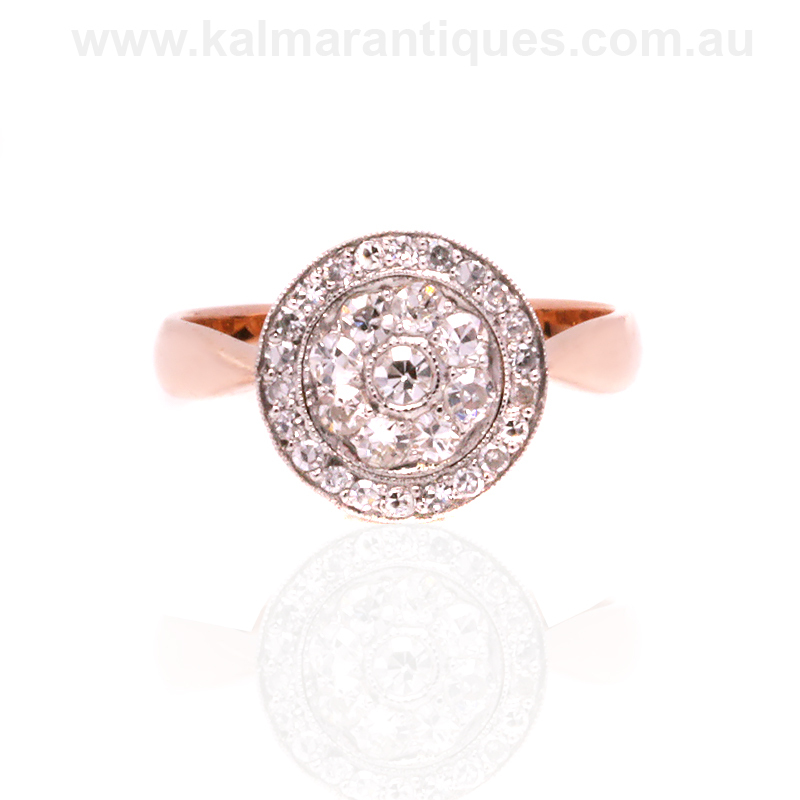 Perfect as an engagement ring, this Art Deco ring is as beautiful as it is special thanks to its two rows of diamonds.